Hairdresser, Halinka Louse Kerr, is taking part in Courage on the Catwalk this year. As Halinka Louise Kerr goes about her day, there is one phrase going through her mind: “Get up, dress up, show up and never give up”. 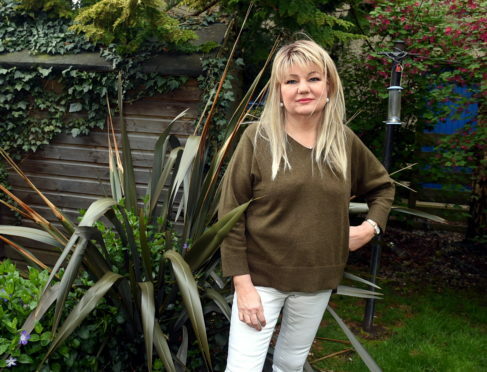 Over the last two years she has been diagnosed with kidney cancer, bone cancer and overcome a brain hemorrhage – but is determined to keep positive and enjoy life at home with husband Stuart and at the hair and beauty salon she works in. So when her oncology nurse Danny Lynch nominated her to take part in Courage on the Catwalk, Mrs Kerr seized the challenge. “There’s no cure for bone cancer,” the 55-year-old, of Aberdeen, said. “I’m living with cancer but I’m not dying. I’m making the most of life. “I’m still going to work everyday. It releases the pressure a bit, talking to my clients and mixing with people. Hearing their stories is my therapy. “I wasn’t sure about taking part in Courage on the Catwalk to start with, but I’ve had a lot of encouragement from my family, friends and clients and I’m so glad I’m taking part. It’s been wonderful so far. “My clients have been asking for demonstrations so I’ve been parading up and down in the salon. Mrs Kerr discovered she had cancer after a gall bladder scan showed a tumour on her right kidney. Doctors did not believe it was going to spread and put her forward to have the kidney removed by robotic surgery. She waited 22 weeks for the surgery and had the kidney taken out in October 2017. However, a follow-up appointment the next month showed the cancer had spread to her rib cage and shoulder blade. In January 2018, it was confirmed the kidney cancer had spread to her bones and she was put on a targeted chemotherapy drug instead of further surgery. Mrs Kerr said: “In March my blood pressure shot up and I had a brain hemorrhage. “I was transferred to Edinburgh and doctors found I had a weak vein inside my head. “I had a diverter stent put inside my brain, which strengthened the vein to prevent it from bursting. “During that time, I wasn’t able to take my chemo drug as I was on other medication. Mrs Kerr was given radiotherapy and another new drug, which appears to be working and has “put the cancer to sleep for now”. She added: “The side effects of the drug can be pretty horrible, but I don’t want to lie down to it. “Get up, dress up, show up and never give up, that’s what I say.